Touch down in exciting Bangkok and experience the colorful atmosphere. In Cambodia, explore the legendary temples of Angkor Wat. Experience the bustling city of Hanoi, the mystic waters of the stretching Mekong Delta, the wonders to be found in Hue and the historic capital Ho Chi Minh. Enjoy an overnight river cruise in Halong Bay and fall in love with charming Hoi An. 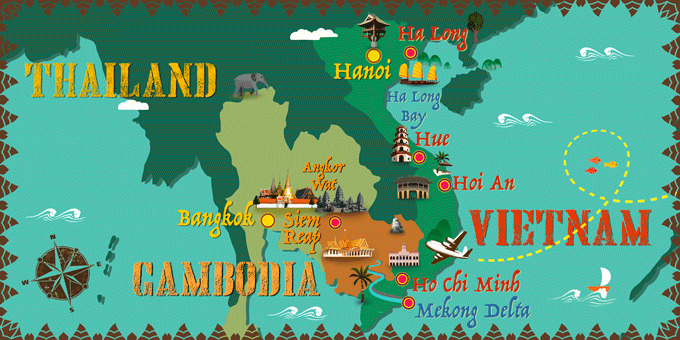 International flights: U.S. - Bangkok & Ho Chi Minh - U.S.
14 Breakfasts, 1 Brunch, 1 Lunch & 1 Dinner. Bottled mineral water and wet wipe on car during the tour in Vietnam. * Details of your internal flights will be detailed in your travel documentation, in your Customer Area, nearer to your departure date. Please Note: If your return flight departs in the evening, your arrival in the Canada will be the following day and the total duration of your trip will be 17 days. Cambodia visa (on arrival), Vietnam e-visa (online before traveling), drinks, tips and any other services not mentioned in what's included. Arrival at U.S. departure airport ready to check-in for an overnight flight to Bangkok. Night on board. Breakfast at the hotel. Spend the day at leisure. We recommend a bicycle tour of the real Bangkok where you can explore Chinatown's narrow lanes and markets for a taste of the liveliest sides of Bangkok. We suggest that you visit the many beautiful temples that are dotted around the city. Overnight in Bangkok. Breakfast at the hotel. Spend the day at your leisure. Why not do some shopping, explore the different neighbourhoods or sample the local cuisine. Overnight stay in Bangkok. Breakfast at the hotel. At the indicated time, transfer to the airport for your flight to Siem Reap, in Cambodia. Arrive, meet your guide and transfer to your hotel. Take the opportunity to explore this beautiful city and get to know your surroundings. Discover the local cuisine and relax at your hotel. Overnight stay in Siem Reap. Breakfast at the hotel. Today explore the most significant temples in the Angkor Complex. Visit the ancient capital, Angkor Thom and enjoy the unique decorative towers of the Bayon Temple. At Preah Khan Temple, wonder at the 12th century splendor before you continue to Ta Prohm in the afternoon, home to the enormous iconic fig tree roots that grow through the middle of the temple. Admire Bayon architecture at Bantey Kdei temple before you finally arrive at Angkor Wat, the world heritage site and most revered of all the Cambodian temples. It features the longest bad-relief in the world and is the perfect place to watch the sunset over the entire temple complex. Overnight stay in Siem Reap. Breakfast at the hotel. You can have a leisurely morning at the hotel or take a take a walk along the river. In the afternoon enjoy a guided walk around the tiny town of Hoi An with the stops at a 400 year old Japanese Bridge, a 300 year old Chinese Temple and 200 year old Vietnamese former merchants' house. Overnight stay Hoi An. Breakfast at the hotel. You will be free in Hoi An until check out. In the afternoon you travel along one of the Vietnam's most scenic highways to Hue. Stop on the way at the white sands of Lang Co Beach and at the top of Hain Van Pass for a panoramic photo opportunity. Arrive and transfer to your hotel in Hue. Overnight stay Hue. Breakfast at the hotel. The day is free at your leisure until being transferred to the airport for your overnight flight to the U.S.